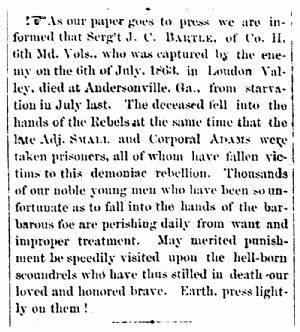 Jan 4 1865 Sgt Bartle dies at Andersonville, Ga.
As our paper goes to press we are informed that Serg’t J. C. Bartle, of Co. H, 6th Md. Vols., who was captured by the enemy on the 6th of July, 1863 in Loudon Valley, died at Andersonville, Ga., from starvation in July last. The deceased fell into the hands of the rebels at the same time that the late Adj. Small and Corporal Adams were taken prisoners, all of whom have fallen victims to this demoniac rebellion. Thousands of our noble young men who have been so unfortunate as to fall into the hands of the barbarous foe are perishing daily from want and improper treatment. May merited punishment be speedily visited upon the hell-born scoundrels who have thus stilled in death our loved and honored brave. Earth, press lightly on them !